A team of researchers, led by Rensselaer Polytechnic Institute professor Yuri Lvov, has found an elegant explanation for the long-standing Fermi-Pasta-Ulam (FPU) problem, first proposed in 1953, investigated with one of the world's first digital computers, and now considered the foundation of experimental mathematics. The research, published today in the Proceedings of the National Academy of Science, offers a mathematical explanation for how a level of energy sufficient to produce one complete wave in an idealized chain of masses connected by springs is gradually distributed to thermal equilibrium. In this system, 32 masses (or particles) can move only left or right, and the energy in the system cannot dissipate through friction or heat. This system, famous among mathematicians and physicists, was introduced by Los Alamos National Laboratory researchers Enrico Fermi, John Pasta, Stanislaw Ulam, and Mary Tsingou as a means to study how heat is conducted in solids and metals. At the time the researchers proposed the problem, they expected their numerical calculations would reveal that the system reaches a state of thermal equilibrium - similar to thermal equilibrium exhibited by gasses - in which the energy within the system is evenly divided among each possible movement (called "modes"). When the problem was first simulated with the Mathematical Numerical Integrator and Computer (MANIAC), one of the first digital computers, the researchers were puzzled to discover that after many iterations, energy within the system periodically dispersed and then concentrated to 97 percent of energy within a single mode. This phenomenon became known as "FPU recurrence" and spawned a wealth of questions and research, in addition to thousands of research papers, becoming the foundation of experimental mathematics. Decades later, using far more powerful computers to run the simulation for greater lengths of time, researchers discovered that energy within the system did eventually reach equilibrium, but the question remained: how precisely was this happening? 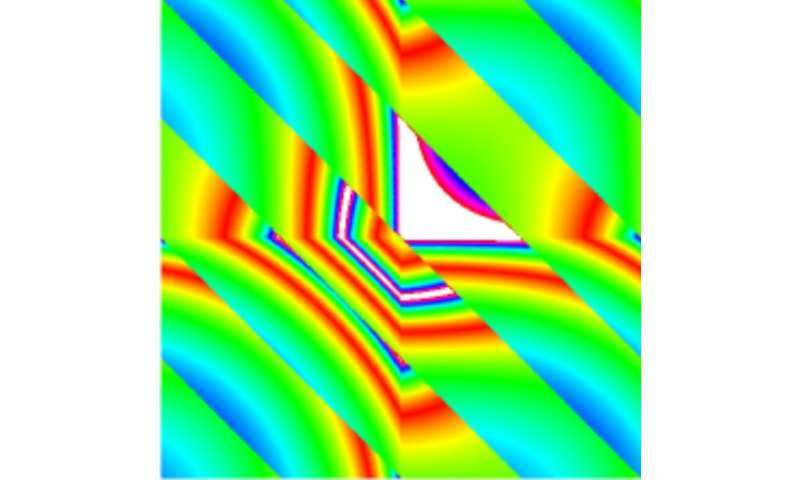 In the paper "Route to thermalization in the α-Fermi-Pasta-Ulam system," the researchers led by Lvov offer a simple and elegant explanation. According to their calculations, the key lies in a gradual transfer of energy during coincidences of six modes in the system. When precisely six modes interact, the energy is transferred in a nonreversible way. Over many iterations, enough six-wave interactions occur, and enough energy is transferred, to reach complete thermal equilibrium. This conclusion is supported by extensive numerical simulations. "The key approach of our research is to consider the FPU system as a collection of resonantly interacting waves, in other words - waves interact in groups," said Lvov, a professor of mathematical sciences in the School of Science at Rensselaer Polytechnic Institute. "My collaborators and I have shown that interactions of triads, quartets, and quintets are reversible; in other words, they do not bring the FPU system closer to thermal equilibrium. However, the interaction of waves in sixtets does lead to irreversible transfer of energy. It takes the cooperation of six different waves to produce an interaction that is irreversible and, because of that, the process is extremely weak and very slow. That is why it takes so long to approach thermal equilibrium for the FPU system." Lvov researches in the area of mathematical physics and nonlinear phenomena, in particular the ocean internal and surface water waves. These systems can be viewed as complex systems composed of interacting particles or waves, which can be described under the general theoretical framework of "wave turbulence theory." Lvov seeks to further develop this theory and to use these developments to study such complex systems. Could classical theory be just as weird as quantum theory? That's a very nice result. It's important to understand not only [that] equilibrium is reached, but how and why and how quickly (or not). And they've nailed it all down.